Jerry Brown, the governor of my home state, recently aired some complaints about college professors and higher education. “What I like about Chipotle,” he told a meeting of the California Chamber of Commerce, “is the limited menu. You stand in the line, get either brown rice or white rice, black beans or pinto beans,” Brown said. “You put a little cheese, a little this, a little that, and you’re out of there. 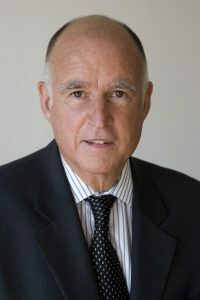 I think that’s a model some of our universities need to follow.” Brown was especially critical of the California State University system, which in his view needs to improve its four-year graduation rates. I have some thoughts about this. For two years I attended Ventura College, one of California’s many community colleges. It was a short walk from my house. Then I earned Bachelor’s and Master’s degrees in history from Cal State Long Beach. It has been a while, but I have some experience with the system. And now I teach at an institution that in many ways is analogous to Cal State, the State University of New York College at Geneseo. I do not know the current graduation rates in the Cal State system, nor whether they have declined dramatically or whether programs are so badly impacted that students struggle to find the courses they need to graduate. Certainly Governor Brown thinks so. And the fault lies with the professors. “They have so damn many courses because all these professors want to teach one of their pet little projects, but then you get thousands and thousands of courses, and then the basic courses aren’t available. It takes kids six years instead of four years,” Brown said. I can only speak to history departments, of course. Certainly there are professors who are intensely specialized and narrowly focused, who teach nothing but what is in their tightly bound field of interest. But some of these courses, I would argue, provide students with a powerful educational experience. Governor Brown is right, in the sense that you learn much after you leave college, but there are skills that students obtain and experiences students have in these narrowly focused courses that can be life-changing. Sometimes narrowly focused faculty are a problem. But in my experience not only are they a minority, but they are viewed as a problem in their department. Far more common are professors who work hard, run themselves ragged teaching courses that cover a vast chronological or geographic range, sometimes far outside their research areas. And I would point out to Governor Brown that I can count the number of historians who have complained about this reality on one hand, and I have been at this for nearly a quarter-century. At Geneseo, I teach six courses a year. Of those, two are what we call service courses, taught for the purpose of fulfilling my department’s commitment to helping students complete their general education requirements. I teach a Humanities course that covers the great works in the western tradition from Classical Athens to Shakespeare, or a freshman writing seminar known as INTD 105. I teach two survey courses, one in Native American History and one on American Indian Law and Public Policy, both of which fulfill general education requirements in a number of categories that students need in order to graduate, and 2 other courses in the department of History. Of the six courses I teach every year, at most two of those are specialized courses directed toward the interests of history majors. My point is that I think Governor Brown has diagnosed the problem improperly. It is important to help students succeed. It is important to ensure that they have access to the courses they need to graduate on time. When I attended Cal State Long Beach, the vast, vast majority of students were commuters. I never knew anyone who did not work part time. I knew many “non-traditional” students–veterans, people coming back after a couple of years, people who bounced around from college to college and found themselves in Long Beach. Some of them were ill-prepared for college, and needed remedial help, which was available. Although Geneseo’s student population is overwhelmingly white and between the ages of 18 and 22, there are schools in the SUNY system with more diversity, both in terms of ethnicity, race, ability and experience. Sometimes students do not have the financial means to make it through school in four years. Things happen. Problems arise. When I attended Cal State, it cost me around 400 dollars a semester. I could work and easily pay my bills. It is not like that anymore. Students may have trouble finding the classes they need, then, because economic necessity might require that they work when classes are offered. And meanwhile, faculty lines go unfilled. There are many problems afflicting higher education, most of them caused by a steady decline in funding. Governor Brown, I know, is humane and interested enough to recognize the value of the liberal arts, of how liberating a college education can be. But if we want our states to offer world class educations, we have to be willing to pay for it. We cannot expect increasingly indebted students to foot the bill. Indeed, it is a good investment for citizens and legislators. You fund the colleges. More students can attend. More classes are available for them. They graduate, earn higher paying jobs than they would if they did not go to college and, voila, they pay more in taxes over the course of their careers than if they did not attend college. Return on investment, right? The current leadership of the GOP, and many Democratic leaders who seemingly want to sound like Republicans on matters of higher education, want to view colleges as elite institution. The truth about state institutions like SUNY and CSU, in my experience, is that they are nothing of the sort: if adequately funded they can become engines of democracy, equality, and opportunity.